The news was updated on August 27, 2018. 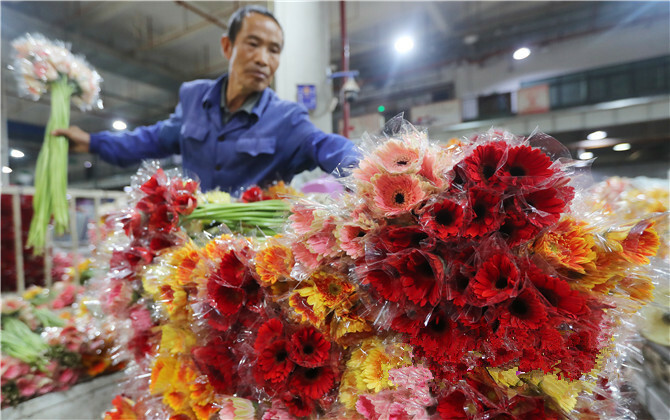 When most get off work in the evening, the Kunming International Flower Auction and Trading Center is filled with flower carts, merchants and service staffs. Within 4 or 5 seconds, the running barometer on the auction clock will come to stop and a batch of flowers will find a certain owner. “To seize the Dounan flowers during auction, you have to be fast or it will be taken by others,” said a flower merchant surnamed Zhang. Native to east China’s Jiangsu Province, Zhang works for a flower company in Kunming, and he added that Yunnan flowers’ quality make them popular worldwide. The trading center hosts around 25,000 flower suppliers and 3,100 buyers. More than 500 flower varieties s are traded at the auction center, including rose, gerbera and hydrangea. Every day, around 3.5 million flowers are usually sold, with the daily trading peak reaching 7 million. Dounan flowers are exported to more than 50 countries and regions, such as Thailand, Japan, Singapore, Russia and Australia, said Zhang Li, general manager of Kunming International Flower Auction and Trading Center. In particular, the recent years have seen an increasing demand for fresh-cut flowers in South and Southeast Asian countries. Now, 20 to 30 percent of Dounan flowers are export to these countries.